Every few years I take a trip and this forum loads me up with great holes in the wall that I never would find just by Googling. I took LOADS of your suggestions back in 2007. You might remember I even blogged about them! Here's the link. We love places that have been open for 50+ years with nice history. We are open to fast food - especially local tastes we wouldn't get in the Chicago suburbs! Holes in the wall are fine. 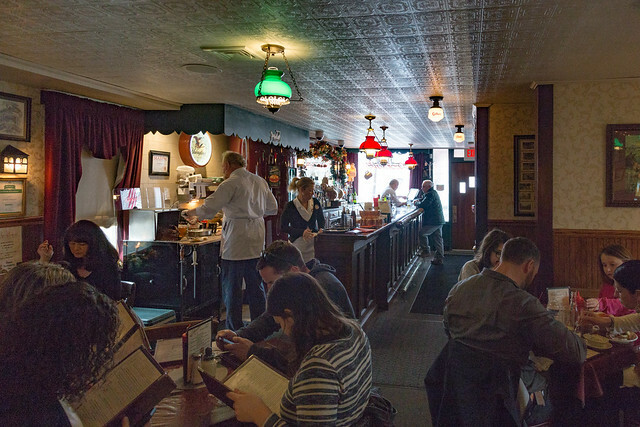 Dingy and old fashioned decor doesn't frighten us if the grub is good. We LOVE homemade rootbeer, ginger ale and cream soda. Near the Buffalo area, we plan to stop at Charlie the Butcher. We're planning to take I-90 (past Utica) then I-87 (Albany) past Poughkeepsie to Plattekill. For lunch, we're on our own at Grand Central Station. Then, we're heading from Plattekill to Sandusky, OH. Passing through Cleveland - We're thinking maybe hitting Michael Symon's Mabel's BBQ or the B Spot. We're looking for a breakfast spot near Sandusky heading west. We might stop there again, unless you offer something different. Also, lunch/dinner near Elkhart/South Bend. We've been to a bunch of the drive-in's in South Bend, so that will be our default if we don't hear something better. So, what say you, Road Food?! Tell us some history about the food in the Poughkeepsie area...and fill in some of the other places, please! This forum has always "served" us well! Smuckers in Toledo is a good one. Old school diner with lots of pie. Oh, and I should mention, I'm reviewing the great list JRPfeff is compiling of Duncan Hines Restaurants still in existence! Thanks for letting us know about Smuckers, ChiTownDiner! Ess-A-Bagel in NYC is my favorite bagel destination. Better Roadfood atmosphere at Schwabl's and a far superior beef on weck. Duff's for HOT Buffalo Wings in Buffalo. 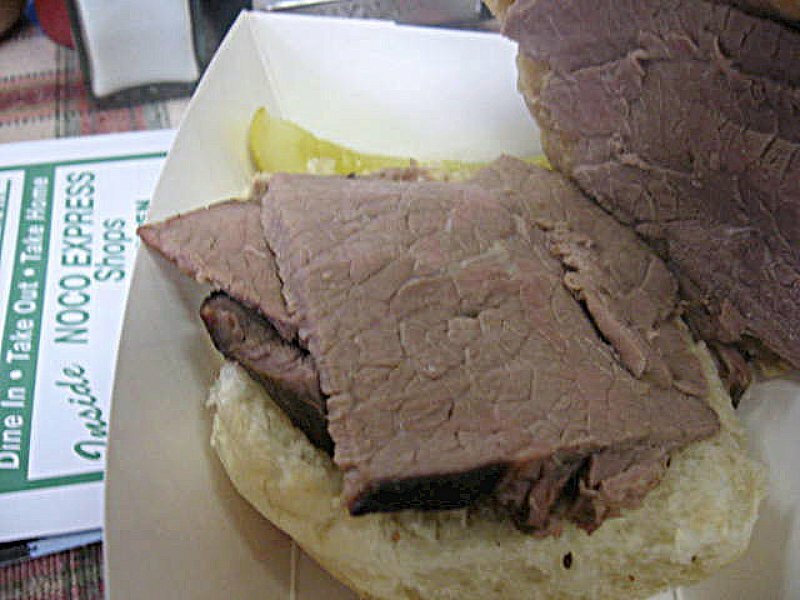 Every time I visited Schwabl's (with the exception of the buffalo bus tour) the meat was medium rare, juicy, flavorful and served on a fresh kummelweck roll. I wish I could remember the place @ 1997 (too many pitchers?) of the Tavern in the Buffalo area that had the slicer for the Beef right behind the bar...IT WAS AWESOME...and the Horseradish...woweeeee. First a scolding: Why the heck haven't we seen you or your husband at any Contingent events?!? Looking at your IN/KY list, you've obviously got a nose for good Roadfood and would be a welcome addition to our group. Who knows, you might even like a few of us. With that out of the way, I'll second the nomination for Schmuckers in Toledo, although now that you mention Gregg's, I feel like I might need to check them out. Your itinerary doesn't specifically mention Cleveland or the Akron/Canton area, but I suspect you'll be passing through one or the other. If you need some recs for those areas, let me know, I've got a solid list of Roadfood worthy spots in both. 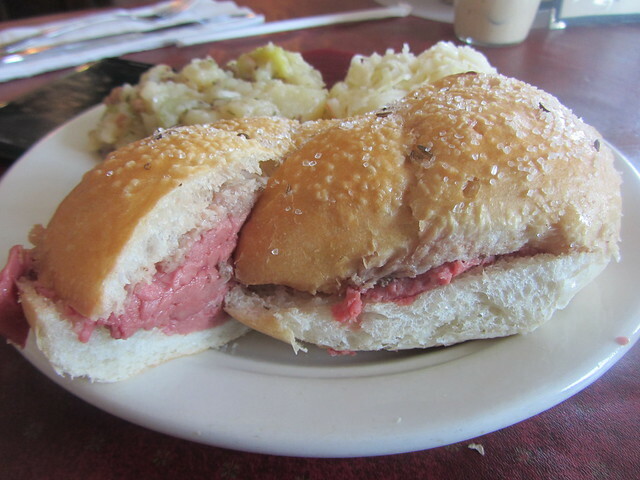 Oh, and I'll agree with WanderingJew: there are things I like about Charlie the Butchers (like, I usually get better weck rolls there), but the overall experience and meat quality is soooo much better at Schwabl's. Was it the carver who was actually slicing the beef? If so that sounds like Schwabl's! My first visit there was in 1996 when I was driving my mother's car from her old apartment in Albuquerque NM to her new Apartment in Albany NY. That trip for me was truly something out of "planes, trains and automobiles"
WJ, Yes-Carving right behind (or in the middle of it) the bar. You could be right. We had already been to Duff's, getting a mini tour of Buffalo's best...with lots of beer. My two cents - I have only eaten once at Charlie The Butcher. It was fantastic. Charlie served us at the counter, slipped a few meat samples of items we didn't order and made the experience through his interactions lots of fun. I have also on eaten at Schwabl's once and that was also fantastic. The history and food were a solid match. If you can only do one, I would lean towards Schwabl's as from my direct conversations with visitors to both, it is more consistent. No one has a mediocre meal at Schwabl's, some have occurred at Charlie The Butcher. Charlie was no where to be found when I was there, which may have led to my much less than mediocre experience. Hello Dana67 and welcome back to the Forums! I noticed that you'll be taking I-90 past Utica, NY. Any chance you'll be able to stop for a bit? Lots of good eats in that city and the Saranac Brewery is there. Website: https://www.saranac.com They give tours and brew their own delicious root beer, which they sell in six-packs in their gift shop. I'm a bit biased as Utica is my college town and I spent years working there and running the Boilermaker 15K Road Race there. Lots of tasty regional specialties not too far off of the NYS Thruway (I-90)! Thank you for all of your suggestions! There were some things we wanted to try...but time wouldn't allow. Here's a rundown of where we ate! We drove straight through from Chicagoland to Buffalo in one day - no stopping for fun food. Our dinner was Schwabl's! We were really road weary so my taste buds might have been off. I really liked the potato salad and the atmosphere. I thought the beef was good, but I wasn't blown away. Again, I think maybe we were just too tired - which was a bummer. Later near Time's Square and Broadway, we stopped at Nathan's for a hotdog on 8th ave. Gotta say, we were really hoping for more. The fries were good, but the hot dog bun was dry and the dog itself...well, we longed for a Chicago dog, I guess. The best food on the trip was at a deli across the street from the Croton Falls train station. I couldn't remember the name, but I just found it on Google Maps! It's "Who's Cooking." I had a breakfast sandwich on a toasted sesame bagel and I thought I had died and gone to heaven. The bagel was crispy, yet soft - I've never had anything like that in Chicago! My husband had a pastrami on rye and really enjoyed it. Aside. We were supposed to have a rest day, but instead we took the train into the city. If we knew we were going back, we would have studied up on the buses. Since we hadn't, we walked to the Nintendo Store. Then we walked to Central Park. We got as far as the Zoo - which apparently is NOT very far at all into the Park- before we had to turn around and walk back to Grand Central Station...in order to catch our commuter and get us back at a decent hour. We still had a 30 min drove from Croton Falls to where we were staying so it was really late. I don't remember what we had for lunch and our late dinner was nothing to speak of. One place we were excited about was Michael Symon's Mabels BBQ in Cleveland. It was a fun place, lots of energy. Lots of food. We were glad we stopped. Before heading home we stopped for breakfast at Dianna's Deli and Restaurant in Sandusky. We've been there before and we like it. Consistent, tasty, Greek place. (If it's not Greek, I would be surprised.) Polite service and they keep your coffee cup filled. We are planning our next trip (Chicago to D.C.) and I'm posting our thread just as soon as I finish this one. I really hope you'll offer up some not-to-be-missed road food! Dana67, sounds like you had a great trip. I looked back at my reply regarding places to eat and I totally blanked out on NYC suggestions. Sorry about that! I've never had a Chicago-style dog in Chicago (just a few times at some of the Shake Shacks here in NYC) but I have a feeling that most hot dogs in NYC pale in comparison to what you can get in the Windy City. I've yet to have a good experience a good Nathan's dog at any branch except the original at the corner of Surf & Stillwell in Coney Island. Next time you're heading to NYC, drop me a line and I'll knock out a list of some of my favorite eats. Thanks, billyboy. We're hoping to get back there sometime. Meanwhile, we're planning a new trip Chicago to MD/DC. I opened a new thread. If you have any suggestions, I'd love to hear 'em!